Download "For Cashback Plus Credit Cards - the Terms and General Conditions which apply to your Cashback Plus Credit Card account." 2 any exclusions which apply and restrictions on the redemption options available (the Retailer Exclusions ); and what percentage of the value of the qualifying purchase will be converted into Rewards. These details may change from time to time. 5.4 The following transactions are not qualifying purchases and will not earn Rewards: (e) (f) (g) (h) (i) (j) (k) cashback obtained at point of sale when making a payment with your NatWest Visa debit card(s); branch counter withdrawals; electronic cash transfers; withdrawals from cash machines; money transfers; repaying borrowing and all bill payments, including credit card and store card bill payments; purchase (including topping up) payment cards, vouchers, foreign currency or travellers cheques; gambling transactions (including a payment to a merchant we identify as being in the business of gambling, even if not for a bet); balance transfers where we pay your debt to another financial institution and charge it to your Cashback Plus Credit Card account; payments not in Sterling (except in respect of Cashback Plus Credit Card transactions); payments outside the UK (except in respect of Cashback Plus Credit Card transactions). 5.5 Interest, fees and other charges are not qualifying purchases and will not earn Rewards. 5.6 If a qualifying purchase is refunded or cancelled or reversed, we will adjust your Rewards balance to reflect this. If you have redeemed your Rewards balance prior to returning any goods or services to the retailer, then we may contact you to ask you not to operate your Cashback Plus account in this way. 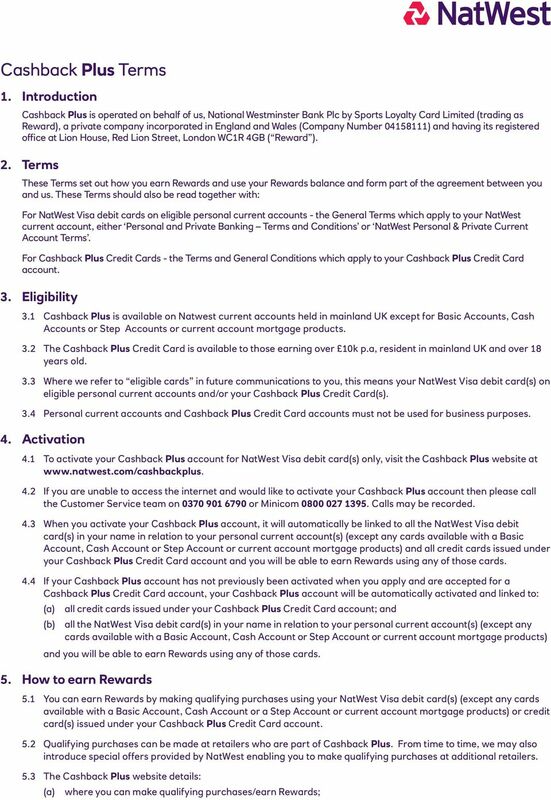 If we issue you with two of these communications but you continue to operate your Cashback Plus account in this way then we may close your Cashback Plus account immediately and we do not need to give you notice as set out in Term 10. Any Rewards balance which has not been redeemed will be cancelled. 5.7 Your Rewards balance is personal and cannot be transferred. 6. How we will credit your Cashback Plus account 6.1 All qualifying purchases will be displayed as pending in your Cashback Plus account until they are cleared. This means that the qualifying purchase has been recorded but is not yet available for redemption. 6.2 Once the qualifying purchase has been cleared, which may take up to 35 days, your Rewards balance will be available for redemption and will be shown as available on your Cashback Plus account. 6.3 If additional cards are issued on your Cashback Plus Credit Card account, any Rewards earned on qualifying purchases made using an additional card will be treated as being earned by you and can only be redeemed by you. 7. How to redeem your Rewards balance 7.1 Unless we tell you otherwise, you can only redeem your Rewards balance when it has reached the equivalent of 5.00 or more. 7.2 Your Rewards balance has no monetary value until it is redeemed. 7.3 You can redeem your Rewards balance by: changing it into cash which is transferred to your NatWest current account; or if you have a Cashback Plus Credit Card account, changing it into cash which is transferred to your Cashback Plus Credit Card account; or changing it into cash which is donated to a participating charity; or exchanging it for vouchers or tickets of a higher value which you can use at selected retailers. Further details of the redemption options available, including any special offers available to you, are detailed on the Cashback Plus website. 7.4 Redemption options and any special offers may only be available for a short period, may require a minimum Rewards balance and will be subject to the Retailer Exclusions. 7.5 Any vouchers or tickets ordered by you when redeeming your Rewards balance will be delivered to the address held on your Cashback Plus account. Delivery within the United Kingdom is free of charge. 4 (e) (f) (g) where we are required or permitted to do so by law and/or by law enforcement agencies, government entities, tax authorities or regulatory bodies around the world; to third party service providers, agents and sub-contractors acting on our or Reward s behalf; to other companies that provide you with benefits or services associated with your product or service; where required for a sale, reorganisation, transfer or other transaction relating to our business; in anonymised form as part of statistics or other aggregated data shared with third parties; or where permitted by law, it is necessary for our legitimate interest or those of a third party and it is not inconsistent with the purposes listed above We will not share your information with third parties for marketing purposes. 9.5 Transferring information overseas We may transfer your information to organisations in other countries (including other RBS companies) on the basis that anyone to whom we pass it protects it in the same way we would and in accordance with applicable laws. 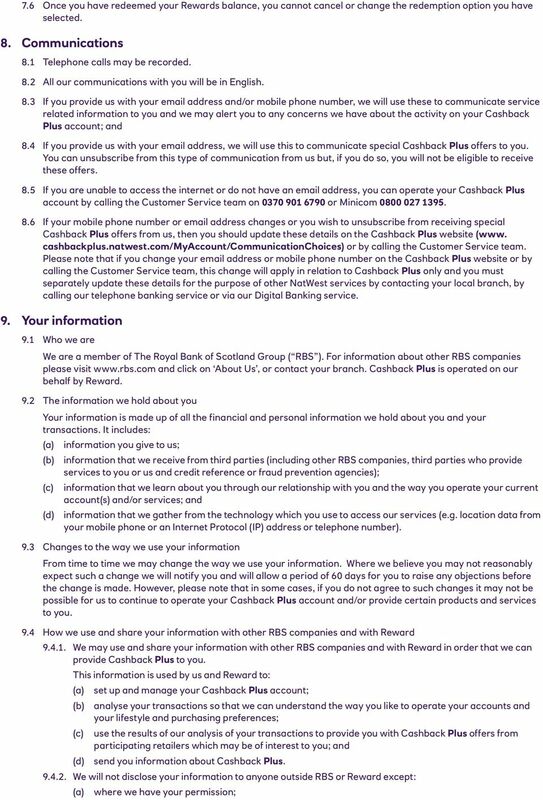 9.6 How long we keep your information We will keep your information for as long as it is required by us or other RBS companies (even if you close your account) in order to comply with legal and regulatory requirements, or for other operational reasons, such as dealing with any queries relating to your Cashback Plus account. 9.7 Security We are committed to ensuring that your information is secure with us and with the third parties who act on our behalf. For more information about the steps we are taking to protect your information please visit personal.natwest.com/personal/security-centre.html. 10. 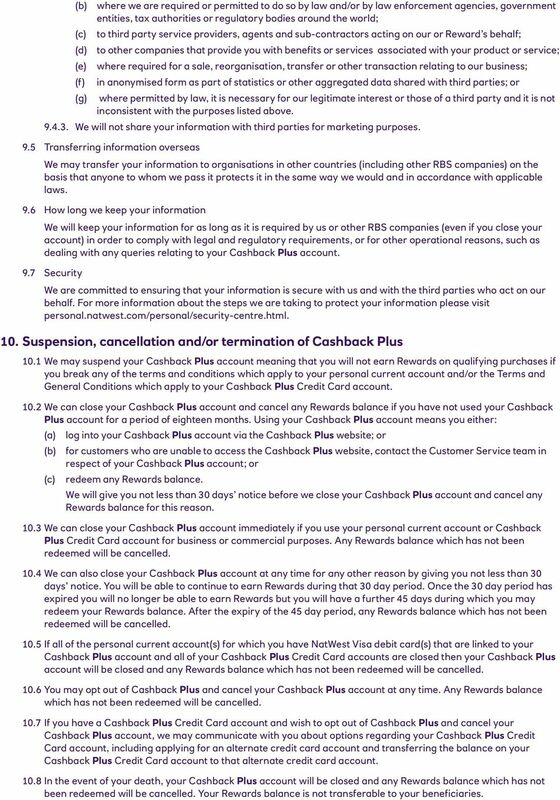 Suspension, cancellation and/or termination of Cashback Plus 10.1 We may suspend your Cashback Plus account meaning that you will not earn Rewards on qualifying purchases if you break any of the terms and conditions which apply to your personal current account and/or the Terms and General Conditions which apply to your Cashback Plus Credit Card account We can close your Cashback Plus account and cancel any Rewards balance if you have not used your Cashback Plus account for a period of eighteen months. Using your Cashback Plus account means you either: log into your Cashback Plus account via the Cashback Plus website; or for customers who are unable to access the Cashback Plus website, contact the Customer Service team in respect of your Cashback Plus account; or redeem any Rewards balance. We will give you not less than 30 days notice before we close your Cashback Plus account and cancel any Rewards balance for this reason We can close your Cashback Plus account immediately if you use your personal current account or Cashback Plus Credit Card account for business or commercial purposes. Any Rewards balance which has not been redeemed will be cancelled We can also close your Cashback Plus account at any time for any other reason by giving you not less than 30 days notice. You will be able to continue to earn Rewards during that 30 day period. Once the 30 day period has expired you will no longer be able to earn Rewards but you will have a further 45 days during which you may redeem your Rewards balance. 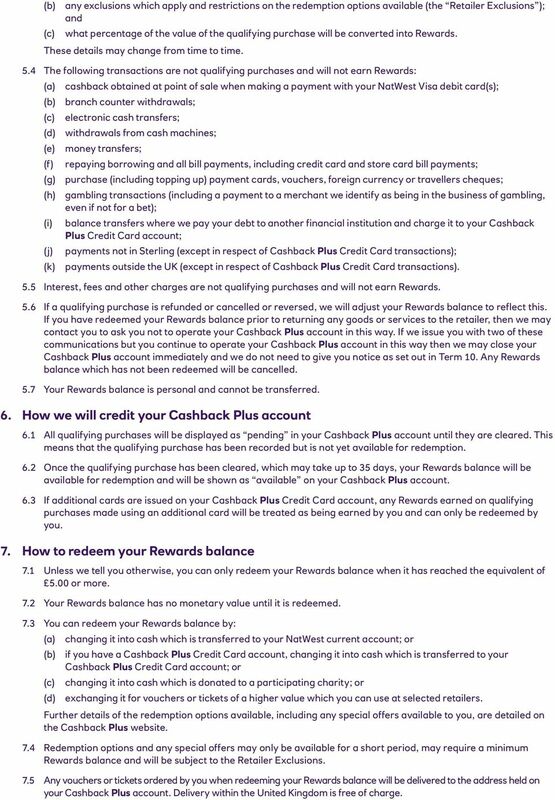 After the expiry of the 45 day period, any Rewards balance which has not been redeemed will be cancelled If all of the personal current account(s) for which you have NatWest Visa debit card(s) that are linked to your Cashback Plus account and all of your Cashback Plus Credit Card accounts are closed then your Cashback Plus account will be closed and any Rewards balance which has not been redeemed will be cancelled You may opt out of Cashback Plus and cancel your Cashback Plus account at any time. Any Rewards balance which has not been redeemed will be cancelled If you have a Cashback Plus Credit Card account and wish to opt out of Cashback Plus and cancel your Cashback Plus account, we may communicate with you about options regarding your Cashback Plus Credit Card account, including applying for an alternate credit card account and transferring the balance on your Cashback Plus Credit Card account to that alternate credit card account In the event of your death, your Cashback Plus account will be closed and any Rewards balance which has not been redeemed will be cancelled. Your Rewards balance is not transferable to your beneficiaries. 5 11. Limitation of liability 11.1 You must keep your security details (which include any identifying words, codes and numbers agreed between us) secret and take all reasonable precautions to prevent unauthorised or fraudulent use of them. We will not be responsible for any unauthorised use of Cashback Plus caused by any unauthorised disclosure We have no responsibility in respect of any tax liability that may arise from your participation in the Cashback Plus scheme. 12. 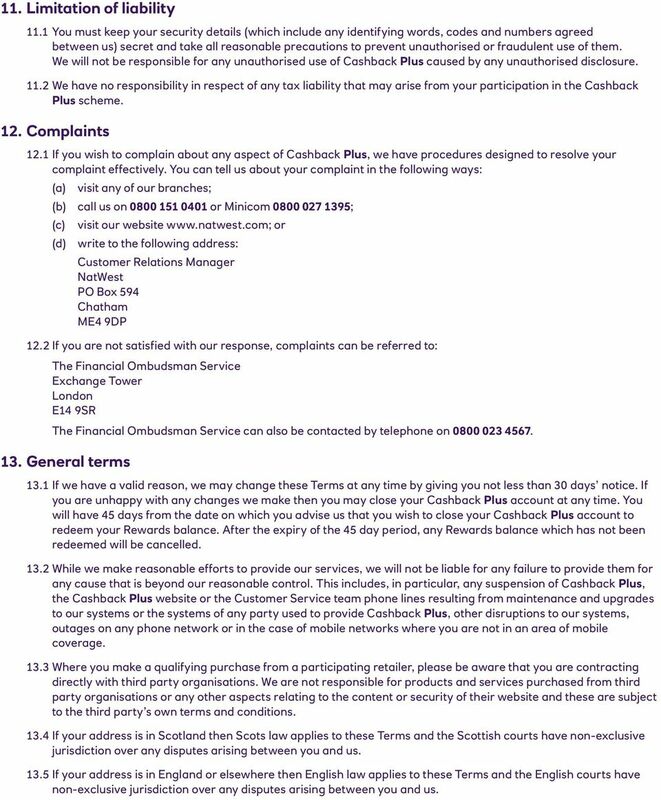 Complaints 12.1 If you wish to complain about any aspect of Cashback Plus, we have procedures designed to resolve your complaint effectively. You can tell us about your complaint in the following ways: visit any of our branches; call us on or Minicom ; visit our website or write to the following address: Customer Relations Manager NatWest PO Box 594 Chatham ME4 9DP 12.2 If you are not satisfied with our response, complaints can be referred to: The Financial Ombudsman Service Exchange Tower London E14 9SR The Financial Ombudsman Service can also be contacted by telephone on General terms 13.1 If we have a valid reason, we may change these Terms at any time by giving you not less than 30 days notice. If you are unhappy with any changes we make then you may close your Cashback Plus account at any time. You will have 45 days from the date on which you advise us that you wish to close your Cashback Plus account to redeem your Rewards balance. After the expiry of the 45 day period, any Rewards balance which has not been redeemed will be cancelled While we make reasonable efforts to provide our services, we will not be liable for any failure to provide them for any cause that is beyond our reasonable control. This includes, in particular, any suspension of Cashback Plus, the Cashback Plus website or the Customer Service team phone lines resulting from maintenance and upgrades to our systems or the systems of any party used to provide Cashback Plus, other disruptions to our systems, outages on any phone network or in the case of mobile networks where you are not in an area of mobile coverage Where you make a qualifying purchase from a participating retailer, please be aware that you are contracting directly with third party organisations. We are not responsible for products and services purchased from third party organisations or any other aspects relating to the content or security of their website and these are subject to the third party s own terms and conditions If your address is in Scotland then Scots law applies to these Terms and the Scottish courts have non-exclusive jurisdiction over any disputes arising between you and us If your address is in England or elsewhere then English law applies to these Terms and the English courts have non-exclusive jurisdiction over any disputes arising between you and us. 6 14. Cashback Plus Household Bills Offer 14.1 Eligibility You are eligible for this offer if you have a: Select Silver Account; Select Platinum Account; Black Account; or any personal current account as a NatWest Private customer (excluding Basic Accounts, Step Accounts or current account mortgage products), and you join Cashback Plus before 11 October We will refer to these accounts as eligible accounts throughout the rest of these terms. These terms will apply during the offer period which will end on 31 December 2015 and will start from: 20 July 2015, if you already have a Cashback Plus account; or 3 business days after you join Cashback Plus. 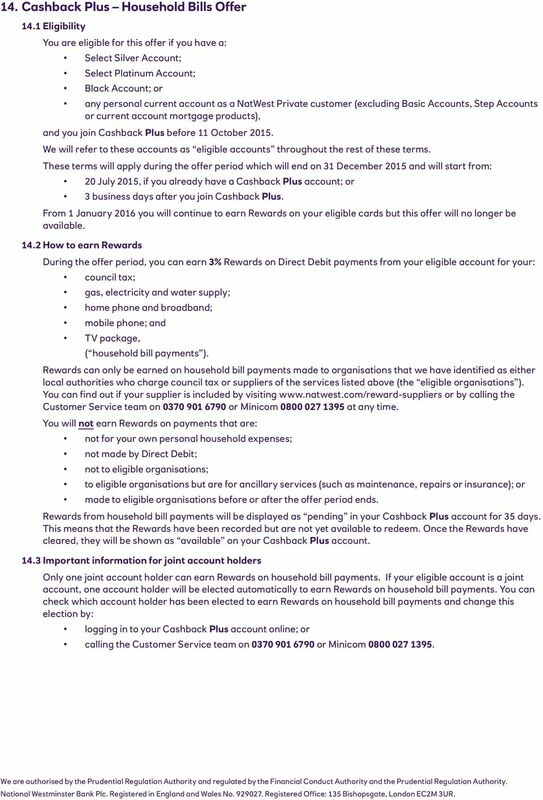 From 1 January 2016 you will continue to earn Rewards on your eligible cards but this offer will no longer be available How to earn Rewards During the offer period, you can earn 3% Rewards on Direct Debit payments from your eligible account for your: council tax; gas, electricity and water supply; home phone and broadband; mobile phone; and TV package, ( household bill payments ). Rewards can only be earned on household bill payments made to organisations that we have identified as either local authorities who charge council tax or suppliers of the services listed above (the eligible organisations ). You can find out if your supplier is included by visiting or by calling the Customer Service team on or Minicom at any time. You will not earn Rewards on payments that are: not for your own personal household expenses; not made by Direct Debit; not to eligible organisations; to eligible organisations but are for ancillary services (such as maintenance, repairs or insurance); or made to eligible organisations before or after the offer period ends. Rewards from household bill payments will be displayed as pending in your Cashback Plus account for 35 days. This means that the Rewards have been recorded but are not yet available to redeem. Once the Rewards have cleared, they will be shown as available on your Cashback Plus account Important information for joint account holders Only one joint account holder can earn Rewards on household bill payments. If your eligible account is a joint account, one account holder will be elected automatically to earn Rewards on household bill payments. You can check which account holder has been elected to earn Rewards on household bill payments and change this election by: logging in to your Cashback Plus account online; or calling the Customer Service team on or Minicom We are authorised by the Prudential Regulation Authority and regulated by the Financial Conduct Authority and the Prudential Regulation Authority. National Westminster Bank Plc. Registered in England and Wales No Registered Office: 135 Bishopsgate, London EC2M 3UR.